Periodically logs are uploaded on LoTW, only the QSO's since August 2011 and some previous. If you prefer confirm via Bureau ( for IK2FDV and IS0/IK2FDV ) send first and I answer without problems, usually I do it once a year, around Christmas. For direct use only correct address reported on QRZ. The answer is send by return mail if is included a SEA -Self Addressed Envelope and sufficient return postage, no IRC please. Just to let you know shipping cost in Italy for letters, maximum 20 grams from 03 July 2018, are 1.15€ for Europe, 2.40€ outside Europe and 3.10€ for Pacific Area. SWL Reports are welcome and appreciated, no return postage are needed. 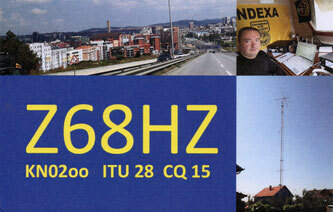 Contact me if you think you've had a QSO with me and you not in the log or if you did not receive my QSL card in an appropriate time.